On behalf of the many loyal patrons of Coventry Village Library we extend heartfelt thanks to the Cleveland Heights-University Heights Library board of directors and administration for their February 16 decision to restore Friday hours to the library's schedule. Combined with the recent restoration of Sunday hours to all branches, the Coventry Village Library will now be able to serve the community on a daily basis. This is good news for residents and also good news for the Coventry retail district, as the library plays an important role in attracting people to our neighborhood businesses. As a cherished neighborhood institution, the Coventry Village Library is integral to the life of the community. With recent and planned upgrades to its historic building, the library has never looked better or been so strongly positioned in its ability to serve its patrons. 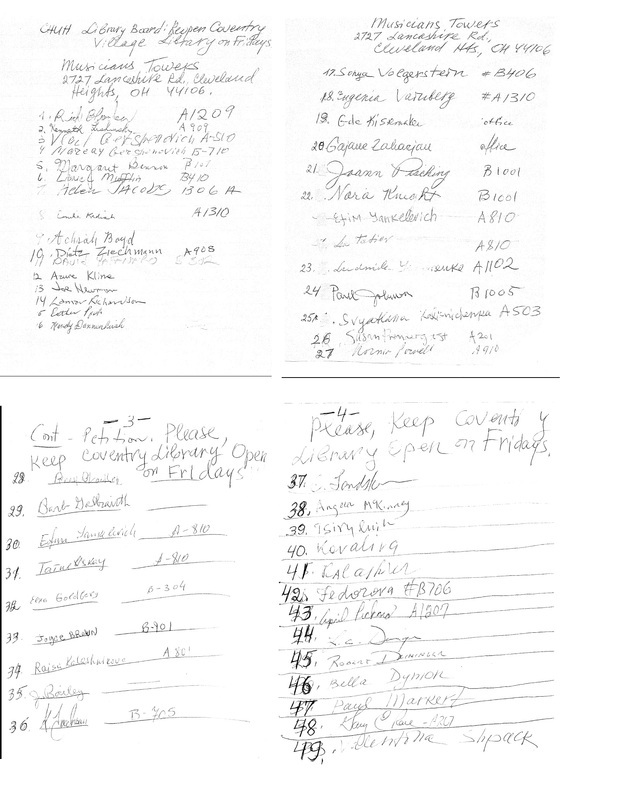 1/13/14 Update: Thank you to the 175 people who signed the petition in support of reinstating Friday hours at the Coventry Village Library, which were removed to accommodate another branch's desire to expand their service hours. The petition was presented to the board at their regular board meeting on January 27th. 2/2014 Update: The board has indicated it will be revisiting this issue at some point in 2014. This page will post any updates about this issue as they become available, so please return periodically. In November, 2013 the CHUH Library Board elected to shut down Coventry Village Library on Fridays, beginning January, 2014, making it the only branch in the system open just five days a week. This decision was reached without an opportunity for public comment, or even an announcement that the board was considering such action. Coventry Village Library is a thriving, successful public library. It provides essential activities and acts as a community center for young and old, especially those without easy access to the internet or readily available transportation. The cut back on hours will affect both the neighborhood and the staff who work so hard to make Coventry Village Library a cornerstone of life for residents of the area. We understand the Board must meet its financial obligations to balance the budget. However, a short term budget constraint should not result in this disinvestment in the Coventry Village branch, a step that could well cause the branch, over time, to be further marginalized. We ask that this decision be reversed and that Coventry Village Library reopen on Fridays. "It is particularly galling to hear the glowing radio announcements of expanded hours at the UH branch without any mention of the fact that those hours are at the expense of the Coventry community. The Lee Road library is not easily accessible to children in the Coventry neighborhood who walk home from Roxboro Elementary and Roxboro Middle Schools." “Please reconsider and reverse that decision. " “I have lived in this neighborhood over 40 years and feel this to be a major injustice that must be corrected immediately. " "This change should have been up for public discussion and input! Very poor planning on the boards part. Will the board be asking for the Coventry neighborhood approval of the next levy?" "I live within walking distance to the library and use it 3-4 times a week. It is a hardship for me personally, to have the thriving Coventry library closed Sundays and now Fridays. This is a walking neighborhood - lots of foot traffic - and the Coventry Library is an important part of the life of Coventry Village. I am upset that this action was done without citizen input or notification. Please reconsider and balance the libraries in other ways. Thank you." "This library is integral to the fabric of the Coventry business district and nearby neighborhoods. Please reconsider closing on Fridays and let’s find a better remedy for the larger financial shortfall and/or lack of patronage at this particular location. Thanks! " "I use the Coventry Library regularly for over thirty years. I just like it. It is well run and people are very helpful." "From the board's comments, it appears as if library hours are treated as a zero-sum resource within the overall library budget, where increments to one branch must result in decrements to another branch. There is also a heavy reliance on circulation numbers as a proxy for the vibrancy of a particular location. However, it would be more accurate to recognize that each branch location has a unique constituency and utilization pattern that is disrupted by closure and the resulting odd-hours/schedule. Further, circulation numbers alone can't provide a complete and accurate measure of the impact of changes to the availability of branch's resources and facilities on the surrounding community." "I have lived behind the Coventry Library for over 30 years. My daughters grew up in that building with programming for children. It was the first place I let my then 6 year old walk to by herself. When she arrived and was leaving, the librarian would call me to let me know. I've attended workshops and lectures and done research in the building. It is a community center for many. It also has the latest releases of books and movies and the staff is most helpful. Please re-consider your decision. Thank you." "Dear CHUH Board of Directors, I and my neighbors and friends at the Musicians Towers are asking, beggin and imploring you to keep Coventry Village Library opn on Fridays. We are the people of the Book. Library is our second home. Most of the people at our building are old, disable and don't have cars. Please, listen to us and act accordingly. Thank you. Eugenia Vainberg and friends at Musicians Towers, 2727 Lancashire Rd., Cleveland Heights, OH, 44106." "The Coventry Village Special Improvement District is committed to supporting CHUH and the Coventry branch. The CVSID is happy to reach out to merchants for their support in programming, marketing or any other areas where we can collectively assist. Angela Hetrick, Executive Director, Coventry Village Special Improvement District"
"To the members of the CHUH Library Board, Since 1975 I have lived in and been a part of the unique community that is Coventry Village and to me, one of the most integral aspects of what has made this community so special has been role that the Coventry Library has played in being part of this community and in attempting to meet its diverse needs. 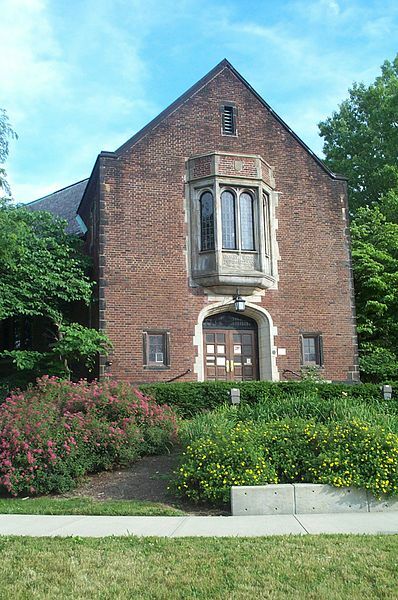 The Coventry Library has a rich history which includes being part of the building that housed the Theater of the Deaf, which brought the deaf and the speaking community together in a unique presentation of sign language and the spoken word to an audience that combined both elements as well. When the Theater of the Deaf was discontinued, the Coventry Library, through some extraordinary efforts of its staff, became a central meeting and programming place for the deaf community, efforts which have continued down through the years and the changing staff. I had the opportunity to be involved as a volunteer in a number of different ways during the 70's and 80's, including the wonderful experience of playing Santa Clause to a group of deaf children. And always present during those and the ensuing years were the friendships of the staff that has made my experience at the Coventry library so enriching and special. When the Library Board announced that they were adding a day of service to another branch of the CHUH library system at the expense of the Coventry library branch, which would be closed an extra day because it had less business than the other branch, I was appalled. I was appalled not only that the library board thought so little of the richness of what the Coventry library has brought to its community, but also the cavalier way in which the needs of the community were being dismissed as irrelevant, in comparison to meeting the requirements of some numerical bottom line. I feel that this decision, and the casual way that it was presented to the Coventry Village community was both demeaning to the Coventry Library and to the community which it serves. I feel that the Coventry library, its staff, and we, the community it serves, deserve better." "Decisions such as the one to close Coventry library Fridays tend to lower public morale and probably in the long run cost the community more rather than less. Why not ring in creative thought about library-sponsored events that would bring in extra revenue? We could enliven the neighborhood rather than depress its spirits if we decide to do so." "The board has the tough task of balancing budgets, which is appreciated and necessary. In diminishing the library hours at the Coventry branch, the light that the library represents to the neighborhood is dimmed. Shorter hours means fewer hours and a negative cycle ensues. Please re-balance the budget in a way that allows the branch to stay open."